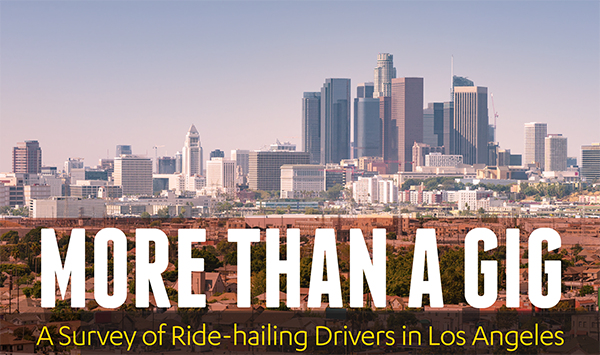 Last week, UCLA Labor Center researchers Saba Waheed, Lucero Herrera, Ana Luz Gonzalez-Vasquez, Janna Shadduck-Hernández, Tia Koonse and David Leynov published our institute’s latest study, More Than a Gig, on the nascent but rapidly growing transportation networking companies such as Uber and Lyft. After reading the report and participating in its release, I am struck by its findings and reminded of research that I undertook almost two decades ago on day labor—at the time, a growing and ubiquitous labor market that we knew little about other than through anecdotes, newspaper accounts or personal experience. My research contributed to discussions and debates about nonstandard and informal labor markets and how worker centers might serve as important intermediaries to improve conditions for day laborers. Adding empiricism, rigorous research, and analysis to debates on day labor and precarious labor markets moved the policy discussion forward in more inclusive and thoughtful ways. Similarly, the ride-sharing industry is well known among Angelenos as we navigate our city’s sprawl; balance the confluence of space, time and traffic; and reduce our stress by letting someone else do the driving. But up until yesterday, we knew little about the labor market conditions of the ride-sharing market. It is my hope that these findings will begin a policy dialogue about how to improve conditions for these workers. First, ride-hailing is neither supplemental nor temporary, and most drivers report that it is their full-time occupation. Full-time drivers tend to be older, come from an immigrant background, use the job to support their families and principally participate in this market for its flexibility. Second, the study finds that costs of working as an Uber or Lyft driver decrease what are already mediocre earnings as drivers pay for car maintenance; car purchases or leases; cell phone mounts; floor mats; seat covers; and even passenger amenities like bottled water, mints or cell phone chargers to improve reviews and maintain employment security. Finally, the study highlights how drivers are structurally and legally limited by the fact that they are independent contractors. Their nonemployee status releases ride-sharing companies from any responsibility for the driver’s wages, work conditions, benefits or workplace protections and safety. Opportunities to organize workers in this growing industry will be difficult for numerous reasons, not least of which is drivers’ invisibility as they navigate the streets of Los Angeles for work. The lack of a brick and motor workplace, worker center or commissary makes the collective organizing of workers in this market even more difficult. The demand side of this industry is mostly unregulated, though municipalities, including many in Europe, are moving to regulate the industry with surprisingly positive impacts. Other possible policy prescriptions—including encouraging fair, accessible, and equitable uses of technology work platforms and organizing with existing taxi collectives and emerging ride-sharing worker centers—could be promising first steps in increasing ride-sharing and taxi driver solidarity and in improving the ride-hailing industry. Abel Valenzuela Jr. is Professor of Urban Planning and Chicana/o Studies, Director of UCLA’s Institute for Research on Labor and Employment, and Special Advisor to the Chancellor on Immigration Policy. Professor Valenzuela is one of the leading national experts on day labor and has published numerous articles and technical reports on the subject. His research interests include precarious labor markets, worker centers, immigrant workers, and Los Angeles. His academic base is urban sociology, planning, and labor studies.